Opendoor Studio: Add Unexpected Color to your Space ! Spring is a time for cleaning, a time For freshening up. Here is a fun do-it-yourself project! Brighten up your space! Find some old branches from around the yard. 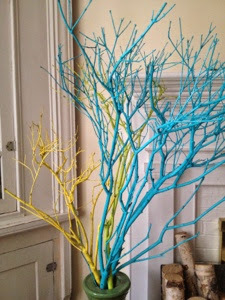 Add your favorite spray paint colors to the branches. Place them in a large vase and enjoy!